We don’t think in these terms very often because we tend to use our countries as our basic unit of analysis and thought. However, more and more we must realize that finance capital has completely eclipsed the power of government and is THE dominant force in the world today. So, we must look beyond our borders and see all of us who work as our brothers and sisters, no matter where they work. 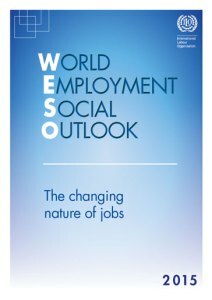 This ILO report makes it clear that 75% of our brothers and sisters work in very precarious conditions and the situation will only get worse for us all. The International Labour Organization (ILO) today warned of widespread insecurity in the global employment market, saying that some 75 per cent of all workers are employed on temporary or short-term contracts in informal jobs often without any contract. Hong Kong (China) and China were the second and the third largest investors in the world, after the United States which remains the largest single source of outward foreign direct investment (FDI). Countries in developing Asia have, for the first time, collectively invested more money abroad than countries in the North American and European regions. Read more folowing the link.